How silly can it get? Thursday was the final day for IOD and it was chockablock full of interesting activities and presentations. As you can see from the photo some of these activities involved fancy dress ala “The Three Amigos” (or whomever they are). Most silly of these was the “What’s Next?” soothsayer event at lunchtime. IBM, like other large corporations these days, requires their senior execs to humble themselves in front of customers and staff members by participating in such activities. It does bear asking “Would I trust the advice of such folks”. In this case, yes as these guys are among the best and brightest that IBM has on their team As a side note, It was good to see Irving once again after a long hiatus. I have very much enjoyed listening to his wisdom and insights over the years at Bill Zeitler’s “Analyst Gatherings”. For those who stayed to the end of IOD it was well worth their time and energy. Some of the best customer and product presos were on Day 4. I spent a number of hours in presentations on the Industry Models, Business Glossary, Metadata Workbench, Data Architect/Data Studio, Information Warehouse, Information Governance, Reference Data, etc. . All of these areas were integrated seamlessly into each conversation giving me ever-more confidence that IBM has worked out nearly all of the integration kinks across the InfoSphere Portfolio and has now moved forward substantially with the execution of their long-term vision & roadmap. This is a very good sign indeed. Many enterprises have been sitting on the sidelines waiting for this to be achieved so that they too can create a true “data-driven enterprise” without have to completely sweep the floor in the process (not that IBM would object to this). 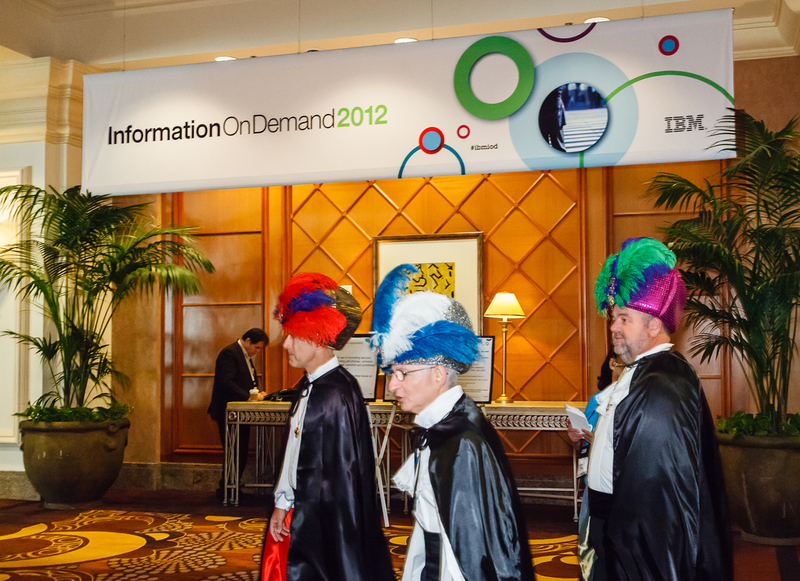 I left IOD feeling very energized about “Everything Big” that IBM communicated over the course of the event. I was especially pleased to have not been assaulted by the term “Big Data” at every turn. Thank you IBM. Looking forward already to IOD 2013. To my Captains of Industry out there, my message is simple; “If you want to create truly sustainable sources of Competitive Advantage from Information & Analytics then you have only one Partner in this journey to consider; IBM. Many others have some of the components required to achieve this desired strategic outcome, but nobody has the fully integrated capability of IBM when it comes to the end-to-end solution set & achieving early time to value. i.e. People (Skills. Competencies), Process (Methodologies, Best Practices, Industry Segment insights) , Technology (Information Management, Analytics. Info Gov) and Culture (Change Management. Organization Optimization). As a final note on IOD 2012, I would like everyone to take-away the beliefs that Information is one of the most critical assets that any enterprise has today. As such it is the full responsibility of the Business Leadership Team to define and execute the long-term strategy for its exploitation and governance. The IT organization is a key partner in this journey, but its role should be limited to providing & supporting the technology underpinnings for information and to manage the successful delivery of all information products as defined by the business. Until my Captains of Industry accept these responsibilities and accountabilities they will never achieve the Competitive Advantage that they so desperately want/need.